For those of you that don’t know me very well (or at all for that matter), you probably aren’t aware that I HATE having long hair. Seriously. It sheds everywhere, it gets tangled in elastics, I go through so much shampoo and conditioner — It is just not worth it! So why on earth is my hair so long at the moment? Well about two years ago I decided that I was going to grow it out so that I could donate it to an organization that makes wigs for people living with cancer. I don’t donate blood, so I thought, why not donate my hair? This actually isn’t the first time I have donated it either. I went for the chop exactly 6 years ago, so I knew what I was getting myself into the second time ’round. The truth is, I actually started growing my hair as I was just too lazy (and maybe too cheap?) to get it cut. When you have short hair, you tend to have to get more frequent cuts to maintain the style. As soon as I let my hair reach the pivotal shoulder length, I decided why not just grow it a little longer and do something good with it? Having long hair wasn’t completely terrible though. I did enjoy curling it and putting it into a side braid (neither of which I could really do with a short mop). There are several organizations in Canada that accept hair donations to make wigs for people living with cancer. The Canadian Cancer Society actually has a website that details the various organizations accepting donations and how to prepare your hair for the big chop. I decided to use the same organization I used 6 years ago — Angel Hair for Kids. The program is part of a Child’s Voice Foundation and provides wigs at no cost to financially disadvantaged children who have lost their hair due to conditions such as cancer treatments, alopecia and even burns. It is pretty simple to donate your hair, however, there are a couple of steps you need to follow. First, your hair cannot be permanently dyed or chemically treated. Second, the hair donation needs to be a minimum length of 12″. Some organizations allow anywhere between 6″ – 12″, so you should check their specifications first if you are considering to donate. If your hair donation meets the requirements outlined above, you can either simply mail your hair directly to the organization, or drop it off in person. Once your hair is received, you will potentially receive a lovely little certificate like the one I got back in 2007 (see below). 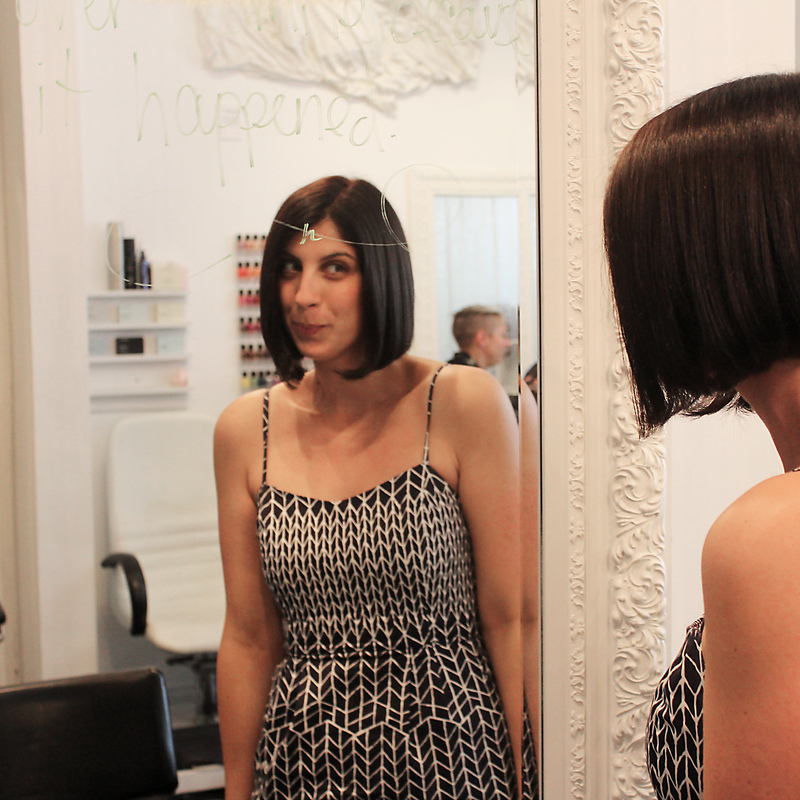 For my big cut, I decided to go to West Salon & Spa located in West Queen West. I have been going there for several years and have always had a pleasant experience and a great cut. Arden was my hair stylist and he was super excited about the dramatic chop. It’s funny, I remember when I went to cut my hair for the last donation and how scared the stylist was in doing such a substantial cut. I guess she was nervous that I would look terrible with short hair. I remember having to reassure her that I normally have shorter hair and it looks good (or at least I think so). With Arden, there was definitely no fear or second guesses. He was up to the challenge and determined to give me a sleek and stylish bob. The first step of the cut was obviously the big CHOP. I placed my hair in a ponytail for where I wanted to have my hair cut, and then Arden cut just above the elastic to keep all of the hair neatly together. That first cut was SO liberating. I actually felt the weight lifted off of my shoulders. Who knew that losing that 12″ of hair (or actually 13″ as I measured it when I got home) could feel so good. It also felt so weird to physically hold the hair in my hands after it was cut off. What feels like so much hair on your head is actually not much hair at all when just placed in a ponytail. I completely understand now why it takes anywhere between 8-12 donated ponytails to make just one wig. The second step of the cut was adding a little colour! I wasn’t planning on doing anything dramatic with the colour, as I more or less still wanted to keep it a dark brown. I just wanted something more ‘rich’, and let’s be honest – something to cover up the greys! I also hadn’t coloured my hair in years, so I wanted to give myself a little treat. Arden whipped up some colour, applied it, and then placed me under a heat dryer for about 25 minutes or so. The anticipation was killing me. Now it was time for business – refining the cut to give me a nice, new, sleek look. While Arden was all chit-chatty during the initial cut and dying process, he was all serious and concentrated when getting into the finer details of the bob. This was totally cool with me as it allowed me more time to get caught up on my trashy magazines. After what felt like sitting forever in the chair (mainly because I was super eager to see my new ‘do), Arden was finally pleased with his masterpiece and took some pics of me checking out my completed look for the first time. Needless to say, I was very pleased with the cut (hence the silly glamour shots I took below). It was a great experience, and I am hopeful that my hair donation will help improve the self-esteem and self-image of a child who has lost their hair due to a medical condition or treatment. If you are interested in donating your hair or supporting any of the foundations that produce wigs for people living with cancer, please visit the Canadian Cancer Society’s web page that details all of this information. Aw. Thanks so much Charlene. Much appreciated! hi Bethany ,looking beautiful with your bob cut .I want to donate my hair it’s very long black hair with out any chemicals ,so can u tell the adresss of the salon where you did and the price for the cut . Thanks so much for your comment. I got my hair cut at west salon and spa located around Queen and Gladstone (west queen west area in Toronto). I can’t remember the price of the cut (as I coloured my hair too), but I’m thinking it was a standard rate between $50-$60. Best of luck with your new ‘do. I hope you will love it as much as I loved mine. Aw Mignonne. What a lovely message. Thanks so much for your support! Bethany, I LOVE the bob do on you! What an amazing project to contribute to, you rock!